With the recent APA decision to prohibit their members from participating in enhanced interrogation, and the demise of the human terrain program earlier this year, the optimistic amongst us might be tempted to believe that the academy is once again purified of its collusions with torture and occupation. The work to be done going forward, however, is not just one of holding individuals to account or raising the bar of individual ethical standards. We also need to find ways of holding academic sciences to account: of treating them not as dispassionate and apolitical ventures, sadly misused, but rather as formed within martial and racist cultures that shape their content and applications. This is as true for disciplines like Physics and Neuroscience as it is for social sciences like Anthropology, or, for that matter, IR. I have to confess, I was late to watch “Zero Dark Thirty” (ODT). I read a handful of reviews and blogs about the movie, had arguments with friends about its message, and even wrote it off completely–all weeks before I bothered to watch it. I wasn’t interested in watching another American war movie, nor was I keen to see the lengthy torture scenes I had read about in the reviews. I figured I already knew exactly what the content was (are there every any real surprises in American war movies? and, didn’t we all know how this story ended anyway?) and that there was really nothing left to say. BUT, I think there is something left to say about the film. First, let’s all be honest: most of us walked away from this movie saying to ourselves “did I miss something?” What about the film deserved all the Oscar hype, debate, and acclaim? By most standards, this was a classic, boring American war movie. In this case, the lack of plot and acting skills are made up with using violent torture scenes rather than expensive battle scenes. There is no emotional journey, no big moral dilemma that the characters are going through (I’ll get to torture soon), little plot twist (again, we all know how it ends after all), and no unique or interesting characters (don’t get me started on Jessica Chastain–what exactly about her stone-faced performance warrants an Oscar? perhaps she deserves an award for for ‘most consistent blank expression’). So what gives? Is this just another “King’s Speech”? Meaning, is this just another big movie that people talk about and get behind, but no one actually can put their finger on what was remotely interesting about it (never mind what was destructive about it)? The film “Zero Dark Thirty” has touched quite a cord in this country, such as with Peter Henne’s post below that responds to my own post further below. To his credit, he opens up another strand of the wider debate this film has touched off. My own reflection delves into the torture controversy writ large, as well as the the purpose and role of art in film making form. Peter uses the latter to widen our view into what this film has to say about civil-military relations in American society. Peter, I wonder if I could draw you out further on several facets of your observation. First it would be useful if you could go into more detail about specifically how Karthryn Bigelow and Mark Boal could have depicted the military personnel in their film more accurately. I take your point that “The Hurt Locker” was riddled with problems in this regard, and not surprisingly complained about widely by military observers. But while the film spends much more time focused on CIA operatives and analysts, it appears that Zero Dark does a much better job of depicting military personnel and how they do what they do. After all, the journalist Boal spent legions of hours with Seal Team 6 and military commanders from CENTCOM. This is a guest post by Peter S. Henne. Peter is a doctoral candidate at Georgetown University. He formerly worked as a national security consultant. His research focuses on terrorism and religious conflict; he has also written on the role of faith in US foreign policy. During 2012-2013 he is a fellow at the Miller Center at the University of Virginia. I appreciated Jeffrey Stacey’s recent post on the debate over “Zero Dark Thirty.” It’s useful to point out what is being obscured by the criticism of the movie’s depiction of torture. But I think his piece missed a broader aspect of the movie, as well as director Katherine Bigelow’s other war, “The Hurt Locker” (which focuses on an Explosive Ordnance Disposal (EOD) team in Iraq): what it reveals about the civilian-military divide in the United States. Now, I realize the obvious response is: “it’s a movie.” That’s correct, but if the biggest selling point of a movie—or two—is their faithfulness to reality, and they get that wrong, then we’re all missing something, right? No one worries about inaccuracies in “Apocalypse Now” because of, well, Marlon Brando. But we should worry about inaccuracies in Bigelow’s war movies. Anyone who did not see “Zero Dark Thirty” on its opening night was smart, as it was mayhem in theaters everywhere. The film shot to #1 at the box office overnight and is there still, for the plain and simple reason that it’s a must see (no spoiler alert here because we all know at least a little about eliminating Osama bin Laden). Zero Dark features a razor sharp screenplay by Mark Boal, top form directing by Kathryn Bigelow, and higher than high stakes drama from start to finish. This film, however, is sufficiently controversial that there may soon be Congressional hearings about it–Sen. John McCain and Sen. Diane Feinstein had it in their sites by day one. The charge is that Bigelow and Boal depict torture in a manner that glorifies it, by way of a plot that allegedly portrays the U.S. government/military eliminating OBL only via intelligence gleaned from full on, no holds barred torture. In my view they are innocent of this charge. The raging debate over the film is misdirected and could do better to be debating this country’s torture legacy rather than a film that deserves serious consideration for a best picture Oscar. One draft of a piece that will not be appearing anytime soon. I will post the other version, a strategic-studies analysis of the outcome of the Deathly Hallows, later on. The sixth Harry Potter film, the Half-Blood Prince (2009), opens with Harry standing side-by-side with his mentor, recently reinstated Hogwarts Headmaster Albus Dumbledore. Blinding flashbulbs illuminate Harry’s vacant stare, rendering the scene a literal, as well as figurative, flashback to the immediate aftermath of the Battle of the Department of Mysteries, in which three clandestine forces clashed within the Ministry of Magic itself: Voldemort’s Death Eaters, Dumbledore’s Order of the Phoenix, and Dumbledore’s Army (the “DA”)—students trained in secret by Harry in “defense against the dark arts.” Harry’s indifference stems from shock: his godfather, Sirius Black, died in the battle, and in the background we hear the voices of Voldemort and Black’s killer, the insane Bellatrix Lestrange. Flash forward to a modern glass-and-metal office building in London. Disbelieving office workers leave a conference table and walk to its picture window as storm clouds appear from nowhere. Darkness rapidly engulfs the sky. The camera tacks into the thunderous clouds themselves as they form into the image of a skull: the Death Eater’s Dark Mark. Three inky-black vaporous streams emerge from it. They look and move like the trails of impossibly agile sidewinder missiles. 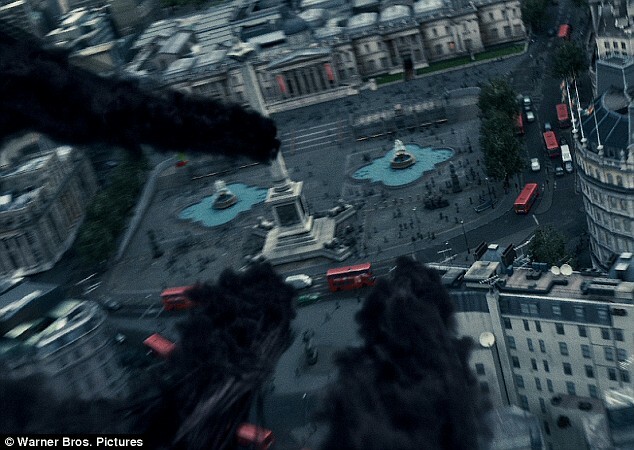 The three, which fans of the films recognize as flying Death Eaters, zoom down over the Thames as the camera moves into position behind them. They streak on through Trafalgar square and the streets of London. They’re no longer sidewinders, but rather supersonic air-launched cruise missiles. They pass into the heart of the wizarding world in London, Diagon Alley, and slam into Olivander’s Wands. The camera pulls back to give a birds-eye view of the shop exploding—sending glass flying and knocking bystanders to the ground. The camera cuts to street level to show Fenrir Grayback, a werewolf and ally of Voldemort, roughly dragging Olivander—head obscured under a blindfolding black hood—away from his shop. In the company of two Death Eaters, Grayback launches into the air with Olivander. But before they leave London, the three fly along the Millennium Bridge. The force of their passage rips the bridge from its supports. It collapses, along with terrified pedestrians, into the Thames. The opening of the Half-Blood Prince continues a trend begun in the Order of the Phoenix, in which danger bleeds seamlessly from the wizarding world into our own, and back again. None of this sequence, I should add, is a faithful translation of the book onto the screen. In the novels, Voldemort is the only Death Eater capable of unassisted flight. Readers learn of Olivander’s abduction via exposition. In the opening chapter of the Half-Blood Prince, recently sacked Minister of Magic Cornelius Fudge informs the Prime Minister of Britain that Voldemort is behind the destruction of a (fictional) bridge: “The Brockdale Bridge – he did it… he threatened a mass Muggle killing unless I stood aside for him and….” David Yates’ direction takes a basic fact about the Death Eaters—they are, by organization and tactics, terrorists—and renders it visceral. Its imagery blurs the distinction between magic and modern weaponry. Terrorism and warfare, it suggests, aren’t so different in Diagon Alley from the streets of Baghdad. Indeed, later on in the Half-Blood Prince, Harry, Ron Weasley, and Hermione Granger take a trip to Diagon Alley to, as they have every year since being accepted into Hogwarts, purchase school supplies. On their way to Fred and George’s joke shop, they pass the abandoned and burnt-out wreck of Olivander’s Wands. As in the books, Hogwarts, already scarred by the brief, but ruthless, tenure of Ministry of Magic hack Dolores Umbridge, has been transformed. The school is under lockdown, protected by magical defenses and the special agents of the Wizard world, the Aurors. We also see it, for the first time, through the eyes of adolescents firmly on their way to adulthood. Harry and Ron tower above first-year students. Yates makes sure we notice snogging teenagers as his camera pans the halls. In some scenes, students lounge around drinking unidentified substances in the hours between classes and curfew. By the film’s end, these twin transitions are complete. Hogwart’s defenses have been compromised through the actions of Draco Malfoy, a student and uneasy Death Eater; Dumbledore lies dead at the hands of Severus Snape—a double-agent for the Order who, at least for the moment, appears to have actually been working as a triple-agent; and Harry, along with Hermione and Ron, has vowed to leave behind Hogwarts to find Voldemort’s remaining horcruxes: hidden containers for parts of his soul that, as long as they persist, protect him from death. In many ways, the Harry Potter series interfaces uncomfortably with most understandings of international relations. Foreign policy is often about balancing unpalatable alternatives, as has been the story of US engagement with the so-called “Arab Spring,” its efforts to ensure the delivery of vital supplies to NATO forces in Afghanistan, and its dealings with North Korea. Rowling’s novels—and their film versions—are too sophisticated not to allow even good characters to make bad, and even cruel, decisions. For example, a significant thematic of The Deathly Hallows is that Dumbledore, who we know as a paragon of moral rectitude and self-sacrifice, has lived a far from untarnished life. The wizarding world that Harry and his friends fight to defend is itself deeply flawed. Its enslavement of House-Elves is so complete that all but Dobby recoil at the thought of freedom. It denies full political and civil rights to other sentient magical creatures, including Centaurs and Goblins. Many of its members look upon non-magical humans (Muggles) with a sense of smug superiority; more than a few refer to witches and wizards born of Muggles as “mudbloods.” The Ministry of Magic proves willing to propagandize against those it considers threats via British wizardry’s leading newspaper, The Daily Prophet. As the series unfolds, we also see it conduct star-chamber trials, condemn people to torture at the hands of the soul-sucking Dementors, and frequently bend to the desires of the rich and powerful. Through all of this, however, Rowling never gives us any reason to doubt that Voldemort and his Death Eaters are evil embodied. They stand for racial subordination, tyranny, and the sacrifice of others to their own ambitions. Voldemort himself is the series’ “Big Bad”; his every action, as well as his very appearance confirms his demonic nature. Voldemort’s eyes are and nostrils are slits, his skin serpentine. He commits numerous atrocities, such as suspending a tortured Hogwarts teacher (of “Muggle studies”) above the table on which he and his followers eat dinner or feeding an innocent old man to his snake familiar. Indeed, while many of Rowling’s “good” characters are flawed, and her “bad” characters—other than Voldemort—capable of redemption, there is little moral ambiguity in Harry Potter. If there exists an explicit foreign-policy message in Harry Potter, it is that we should not sacrifice liberty for security. The books are resolutely anti-torture. Hogwarts games keeper Hagrid is briefly sent to Azkaban—the wizarding world’s Guantanamo Bay—without anything approximating due process. Sirius Black spends years there for crimes he didn’t commit, during which he is driven (temporarily) insane. Rowling strongly suggests that even the guilty do not deserve punishment at the hands of Azkaban’s Dementors. In fact, the Ministry’s practices prove steps along the slippery slope to fascism and tyranny. Once the Death Eater’s subvert it from within, they easily harness its institutional apparatus for the persecution of mudbloods and other “undesirables.” They deploy its propaganda to further their ideological of racial purity and magical superiority, as well as to brand Harry the most dangerous enemy of the wizarding community. Although they control some recalcitrant officials with the Imperious Curse, others, including Umbridge, eagerly embrace the Ministry’s new policies. As long as Voldemort stays in the shadows, many wizards and witches don’t even recognize that his forces have seized control. Once the Ministry falls, the dominant tropes of the two Deathly Hallows films increasingly center around those of a resistance movement fighting against a tyrannical regime. As Harry, Ron, and Hermione pursue Voldemort’s horcruxes they mount what are, in effect, guerilla raids against the Ministry and the Death Eaters. Disguised as employees, they sneak into the Ministry to retrieve a horcrux, find themselves freeing a group of “mudbloods,” and barely escape capture. They spend a good deal of the rest of the film running and hiding. 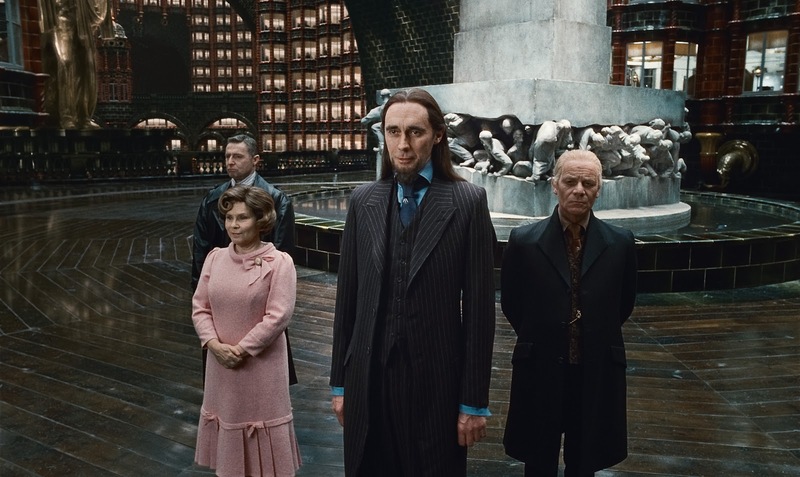 Eventually, their attempts to gather intelligence lead to their apprehension by a group of Death Eaters. With the assistance—and self-sacrifice—of Dobby the House-Elf, they escape from the clutches of Bellatrix Lestrange only moments before Voldemort arrives to kill Harry. Most of Part II concerns the final showdown with Voldemort and the Death Eaters. The pre-title sequence of Part II begins with Voldemort acquiring the most powerful wand ever created—the so-called “Elder Wand”—which he believes will make him invincible. The Battle of Hogwarts provides the major set piece of Part II, but beforehand some unfinished business remains. Harry, Ron, and Hermione steal one of the final horcruxes from Gringott’s Bank—the HSBC of the wizarding world… if HSBC were run by goblins and stored its patrons’ treasure in vault-lined caves and tunnels. Once again they narrowly evade capture, only this time they do so on the back of an abused dragon who guards the most important vaults. Their ride over London provides our last glimpse of the Muggle world until the film’s epilogue, which is fitting, because from hereafter we are firmly in the realm of fantasy. The Battle of Hogwarts features a titanic clash between good and evil; moments of redemption , self-sacrifice, and rebirth; the triumph of the few over the many; and a final duel between Voldemort and Harry. The “Elder Wand” betrays Voldemort; it recognizes, for reasons too convoluted to explain here, that Harry as its true master. In the end, Harry breaks it into pieces and, in doing so, renounces the will-to-power that so twisted Voldemort. In this respect, Harry Potter and the Deathly Hallows, Part II, is something like comfort food for unsettled times. Many people whom fans have grown to care about lose their lives, but never in vain. Voldemort’s defeat marks the end of the Death Eaters: absent his vision and the fear he inspires, they cannot recover. No wonder long-circulating comparisons between Voldemort and Osama Bin Laden gained a new lease on life in the lead up to the film’s release: for a generation reared on Harry Potter and marked by 9/11, it seems fitting that US forces killed Bin Laden not long before opening day. And it is nice, just for a moment, to imagine that Al-Qaeda, like the Death Eaters, will simply melt away. But I think it is too easy to dismiss Harry Potter as fantastic escapism. Popular culture seldom has a direct effect on international politics. Instead, it supplies common referents that shape our understandings of events; its images, narratives, and ideas intrude into the “common sense” of its consumers. How it represents, for example, ethnic groups, ideologies, and threats matters. Thus, the very idea of an analogy between Voldemort and Bin Laden, and the ease with which it comes to mind for students of a certain age, takes on some significance. To the extent that popular culture influences our understandings of right and wrong, then the content of Potter’s moral compass matters even more. Rowling’s sophisticated treatment of torture, justice, propaganda, political inequality, and the dangers of state excess are likely to be among the enduring legacy of the novels and films. Alyssa Rosenberg has a good discussion of the anti-torture themes in the Harry Potter series. But she neglects two other ways in which J.K. Rowling critiques the US conduct of the war on terror: Azkaban and arbitrary detention. 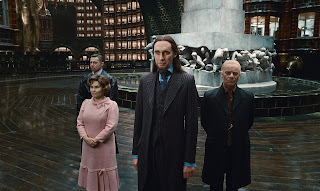 Harry’s disdain for the ministry in The Half-Blood Prince focuses on their detention of Stan Shunpike in Azkaban — Stan’s obvious innocence doesn’t deter Minister of Magic Rufus Scrimgeour from scapegoating the young man as part of his effort to create the illusion of security in the Wizarding world. Indeed, Azkaban itself could be any number of soul-devouring prisons in the Muggle world, but in the the last few books it sometimes seems a stand in for Guantanamo Bay. Given the obvious connections between the Death Eaters and terrorist organizations — from their methods to their cell-structure organization — it doesn’t take much to read the later novels as, in part, a claim that state terror, whatever its purpose, inevitably corrupts democratic governance and renders it vulnerable to fascism and totalitarianism. UK Torture Inquiry: Our BFD? The coalition government here in the UK has announced that there will be an inquiry into torture and rendition alleged to have been carried out since 9/11. This was a major item platform for the LibDems and some Tories, the latter group while conservative, committed to a deep sense of eroding “British values”. The judicial inquiry announced by the foreign secretary into Britain’s role in torture and rendition since September 2001 is poised to shed extraordinary light on one of the darkest episodes in the country’s recent history. It is expected to expose not only details of the activities of the security and intelligence officials alleged to have colluded in torture since 9/11, but also the identities of the senior figures in government who authorised those activities. This is – to put it in Biden terms – a BFD. First, there is no doubt some of the motivation here is for the other two parties to really stick it to Labour. But to be honest, it’s nothing that they haven’t brought onto themselves if the Inquiry does find that then-senior Labour MPs/Cabinet ministers knew they were acting illegally. So, provided the allegations can be substantiated (I’m guessing at least some will), the bigger question will be if these individuals justified, in any way, of making the decisions they did, under the circumstances. (The Michael Walzer/Dirty Hands approach). Human Rights lobby groups are probably going to give a definite “no” to this but it will be interesting to see what an inquiry will say. Any individual named by a commission would have a very difficult time traveling around the rest of the Western world, particularly Europe, for a very long time. While the commission would not in and of itself be a trial (it seems to be framed as an accountability mechanism more or less) it could lead to formal charges elsewhere. The UK is, after all, party to the ICC. Finally, for relatively obvious reasons, I can’t see this happening in the US. Yet it seems clear that the decisions of US decision makers, and their impact on UK decision makers, is going to come to light. Like the Iraq Inquiry, a UK commission will effectively be putting US policy on trial. However, I can’t see something like this happening in other countries like Canada either – where there is a good chance that senior government ministers in both political parties made decisions that contravened the CAT or their own domestic laws. Although, to be fair, the Canadian government at least held a commission as to why a citizen was permitted to be rendered to Egypt for torture and the Canadian government officially apologized. No official was ever held accountable. 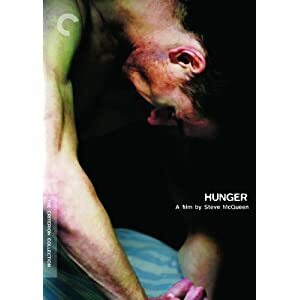 I finally took the time (and found the courage) to watch Steve McQueen’s “Hunger” (2008). It is the story of the events that led to the 1981 Irish hunger strike at Maze Prison in which Bobby Sands and nine other men died. The film is hauntingly beautiful from an aesthetic standpoint and horrifying intellectually. There are very few films which actually merit the adjective “powerful,” this is one of them. Critics will undoubtedly take issue with the film for its failure to contextualize the crimes (and therefore the punishment) of the IRA “terrorists,” but the film is not a history of the “Troubles” per se. Even if one absolutely condemns the violence of the Irish Republican Army (IRA), the film forces the viewer to confront the relationship between the state and the body. The aim is obviously preemptive propaganda, but Thatcher’s rhetoric is fascinating. Hunger, the weapon of the weakest of the weak, is described as a continuation of terrorist violence. The slow, silent, lonely, and intensely painful drama of suicide through starvation is characterized as a mere sleight of hand, a cheap trick designed to stoke hatred by eliciting pity. While Sands and his colleagues did undoubtedly seek to elicit pity and revive the republican cause, their protest was more than a mere final trick. From the vantage point of the film, the disembodied voice of Thatcher sounds un-human, desperate, and powerless to all but the most gullible and close-minded. It is clear that the hunger strike returns the state to a Foucauldian situation in which it must risk a trial of strength in public with the body of the condemned. “We were not given toilet paper or water to clean ourselves after using the toilet; only our hands could be used, but could not be washed afterwards. This is how those who claim to defend human rights made us live,” (Zaeef 2010, 196). From what I understand the UK abandoned the practice of force feeding in 1917 after it led to the death of an Irish prisoner, Tom Ashe. The US government, however, still seeks to deny prisoners that it labels as terrorists the right to play even this “last card.” Some of the hunger strikers in American facilities like Guantanamo were reportedly force fed and prevented from vomiting nutrients. Mullah Zaeef’s recounts that eventually the doctor-in-charge at Guantanamo refused to continue force feeding the prisoners during the 2005-06 hunger strike. One has to wonder what the practice of force feeding says about the US and its understanding of the body of the suspected terrorist. One could argue that the act of force feeding a mentally sound, political prisoner foreshadows a totalitarian impulse which we as Americans would prefer to associate with other regime types. Even the publicly released images of those prisoners in orange jumpsuits, kneeling in stress positions with heads covered and ears muffled, conjures a body completely turned over to the power of the state. The prisoner is in a limbo where they cannot be human and have absolutely no rights. That we as Americans tolerated such tyrannical behavior from our own government perhaps speaks to the autistic hysteria under which we have lived for nearly a decade. Either that or it speaks to the utter indifference we hold for those who are merely accused of being enemies of the state. In the docu-drama “The Road to Guantanamo” (2006), there is an odd scene where an American prison guard (in real life his name is Brandon Neeley) asks one of the Tipton Three to rap for him. The guard becomes uncomfortable when he realizes that these kids being held in Guantanamo not only speak English but are products of an Americanized global culture. It is as if the body of the prisoner comes to have a soul, at least in the eyes of one guard for one brief moment. (Although it is not depicted in the film, the guard resigned from the US military in 2005. He has contributed to the Guantanamo Testimonial Project and has apologized to Shafiq Rasul for the treatment that was inflicted on him. The apology has been accepted). If a common language can create a minimal sense of shared humanity even amongst sworn enemies, then it is stunning to realize what the Britons did to the Irish in Maze prison. In “Hunger,” the prisoners use Gaelic to organize their resistance, although not all of the prisoners speak the “national” language. And while all of the prisoners understand and speak English, there is almost no dialog between the prisoners and their keepers. Perhaps the point of the film is that language itself dies as the body is subject to increasing pain. And it is the death of language that permits such depravity. Charli linked to a great round-up of theories circulating that propose to answer the rather interesting question of why countries that sign the Convention Against Torture seem to have a greater likelihood of committing torture. One working paper in particular , by James Hollyer and Peter Rosendorff of NYU, has caused quite a stir. 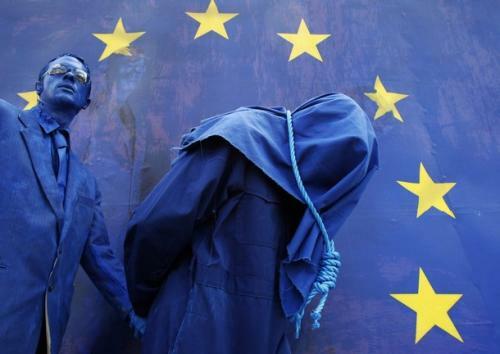 They propose that dictators use the signing of such a treaty as a costly signal to domestic opposition groups that they fully intend to continue torturing those that oppose their regime. How does this work? We argue that authoritarian states ratify human rights treaties explicitly because they do not intend to comply. And it is important to those signatories that all observers understand that they have no intention of complying at the time of accession. The logic, while counterintuitive, is straightforward: an elite facing threats from a domestic opposition can mitigate these threats by engaging in torture. If there is any additional cost to the elite of signing and then being found to torture, the act of signing the agreement signals to the opposition the strength of the elite’s commitment to remaining in power. Accession is a signal to the opposition of the very high value the elite places on holding onto power and its willingness to use torture if necessary. On observing the government’s accession, the opposition – now better informed about the value the elite places on holding power – will rationally reduce its anti-regime activities. The government continues to torture, but will torture less. On the other hand a regime that doesn’t sign shows itself to be vulnerable to the added costs associated with the use of torture. Thus, the opposition will increase e orts to remove the regime on seeing that the government does not sign. 1) If it is well known that the conversion rate, if you will, for bringing accused torturers to justice in connection with the CAT is quite low, then why would a domestic audience see this as a credible signal? Any dictator could sign the treaty regardless of whether their type was of a moderate or an extreme–if the signal could easily be sent by either type it can’t differentiate. Additionally, the more credible signal is one that actually demonstrates the will and, more importantly, the capability of the sender. In this case, if a dictator’s real aim and desire is to signal that they will do whatever it takes to stay in power why not just make an example of revolutionaries, rebels, etc? Show that you have the will and capability to do whatever it takes to stay in power (thinking here of Barbara Walter’s work on why some states negotiate with separatist groups and others choose violent repression). 2) Given that, I am more inclined to see it as a low-cost, public relations move to placate domestic and international critics. By signing the CAT a dictator can point to his/her efforts to play by the same rules as other governments and to treat their citizens humanly. The next time they are getting reamed out at some summit or UN meeting they can say “yes, but, we did sign the CAT”. They don’t really need to send a credible signal with the move, just create a useful tool in their public relations arsenal. 3) Additionally, violent, repressive dictators are less likely to fall from power. Therefore, they are less likely to be placed in a position where they could be prosecuted for their actions under the CAT. Combine this fact with the potential usefulness of signing the CAT from a public relations standpoint and you have another potential explanation aside from signaling. Moreover, it would also explain why ‘moderate’ or ‘competitive’ dictatorships are less likely to sign the CAT–precisely because their are more vulnerable to losing power and could therefore be brought to justice under the CAT. Given that the public relations gains are modest compared to the potential costs of actually being prosecuted, moderate dictators would be less likely to sign. Just my initial thoughts. In general, the data is quite intriguing as is Hollyer and Rosendorff’s theory–certainly a puzzle well worth exploring. The two different countries I call home (Canada and the UK) have recently had to deal with universal jurisdiction in relation to war crimes. First, as I’ve written about here, it has come to light that Canadian officials likely knew that Afghans captured by Canadian forces and subsequently transferred to Afghan prisons were being tortured. Failure to react to such allegations and relevations is a crime under the Third Geneva Convention Relative to Prisoners of War. Yet, what is interesting about this particular issue is that the Geneva Convention is quite clear that it is the government (as opposed to the military) is responsible for the violation of the law. Yet the Canadian government has so-far refused to open up an investigation into the allegations (made by a Canadian diplomat, Mr. Colvin who served in Kabul and now does so in Washington). Instead, the issue is being handled by the Military Police Complaints Commission. The question is whether or not this is sufficient for the International Criminal Court – of which Canada is a party – who could potentially begin an investigation if they felt that the actions of Canada were insufficient. That the ICC prosecutor, Luis Moreno Ocampo has previously indicated this year that he willing to open up investigations into Western governments, does seem to leave the Canadian government in a potentially vulnerable position. Second, a judge in the UK recently issued an arrest warrant for the former Israeli Foreign Minister Tzipi Livni for war crimes at the request of Palestinian plaintiffs. The allegations made against Livni were that she was responsible for war crimes committed during the Israeli offensive in Gaza last year. The warrant was revoked when it was announced by a very angry Israeli government that Livni would no longer be visiting the UK for her scheduled meeting with UK government officials. Additionally, the warrant was the cause of significant embarrassment for the UK government whose role in the Middle East peace process is now in some doubt (particularly as Israeli officials will now not be particularly likely to visit the UK). But the Court which issued the warrant has the right to do so at its own discretion. As war crimes have universal jurisdiction, the court felt that it was free to act. For advocates, of universal justice, the implications of both of these cases are clear: it is about promoting the rule of law and addressing grievances so that real peace can be built. More simply, it’s the idea that justice should not stop at a national border. Officials, whether they are the Canadian Minister of Defence, the President of Sudan or the former Israeli Foreign Minister should all be susceptible to indictment. And clearly, for the governments of these countries, it is about pragmatism. International legal arrangements which effectively damage diplomacy, or the ability of officials to do their job, is of benefit to no one. But in reality, such concerns may also extend to the international legal institutions themselves. Although Ocampo may be a fan of universal jurisdiction, this may be tempered by a degree of realism. As the ICC and the US government under the Obama Administration are slowly working towards a new understanding (if not an entirely improved relationship), any attempt to prosecute Canadian officials may actually scare away the American government even further from the ICC – particularly given its skittishness about “activist” lawyers, politicized cases under the banner of universal jurisdiction. To some extent it comes down to the old (clichéd?) question of “Order vs Justice” in International Relations – whether we should let justice be done though the heavens fall, or whether order without justice can really be considered any order at all. Perhaps more simply, it is at what cost international institutions (or even domestic ones) are willing to demonstrate their power – even perhaps at the risk of losing it. If they do act, they may be limited by politics; but if they don’t, they already have been. *See what I did there? That’s the kind of skill you learn in a quality grad school. A few months ago fellow NYU inhabitant Joshua Tucker of The Monkey Cage asked what, if any, social science research had been done on the effectiveness of torture in obtaining valuable intelligence? Josh’s primary question was an ethical one, that being if a researcher had a personal objection to the use of torture, but through an empirical analysis of data found that it in fact did extract valuable data, should the researcher attempt to get it published despite his or her personal objection? This touched off a very interesting discussion among Monkey readers, and I recommend it to all. Today, Josh revisits the topic, but this time with a bit of relevant research in hand. In “Interrogational Torture: Or How Good Guys Get Bad Information with Ugly Methods,” John Schiemann presents a theoretical model of an interrogation. Briefly, the model has two players, the detainee and the state, where the state is uncertain about the value of the detainee’s knowledge and the detainee is uncertain as to the state’s willingness to use torture. The state moves first, by either asking leading questions (uninformative signal) or objective questioning. The detainee must then decide to send a valuable message, or not. Finally, the state evaluates this message to ascertain the detainees type, and from this decides whether to use torture to extract additional information (for a full description of the game see the paper). …even in a worst case scenario in which torture is shown to be effective under some limited circumstances, we would want to know that. What is the alternative? The alternative is to do nothing and help preserve a status quo in which torture is unrestrained. As difficult as it would be to swallow a result showing some limited effectiveness of torture, I’d rather live with that than what the U.S. has been doing – and perhaps is continuing to do. There are two interesting points of discussion that fall from this discussion. First, do we believe the model presented above is an accurate or useful interpretation of the decision process of a state to use torture? One weakness to note is the presumed equality of uncertainty between the players. The state is rarely completely uncertain as to the value of a detainee’s knowledge. Presumably some amount of intelligence collection went into the decision to capture and interrogate a detainee, therefore, the state can (and does) have the ability to rank the value of detainees. Likewise, unless a detainee is the first of a given conflict, the game is clearly repeated; consequently, all subsequent detainees will be able to update their beliefs about a state’s type. It may be more valuable, and easier to model, to make this a repeated game of one-way uncertainty, where a state is known to use torture, but the type of detainee is unknown by adding noise to the intelligence collected on a detainee prior to capture. The second point of interest are Schiemann’s thoughts on how social scientists should approach researching ethically sensitive topics (for his full remarks see the Monkey post). My opinion is that all finding should be disclosed; first because it is a fundamental principle of scientific endeavor, but more to the point, it can expose false assumptions and promote more accurate models to be built and explored. For example, the model above is an excellent first step toward building a theory of how a state decides to use torture. As we can clearly see, however, it is in no way the definitive model on the topic. If the results from this model show that torture is effective that does not mean it should be used. On the contrary, it means that under the assumptions of this particular model, in some cases, it is shown to be effective. Improving the model, and generating new results, may alter the conclusion completely (or not). This iterative process is the only way to contribute valuable knowledge to a discipline. I am interested in other’s thoughts, both in terms of the model, but also how to approach research on these kinds of topics. Particularly from practitioners (not necessarily of torture) within the defense community. How is this model getting at the dynamics of interrogation, and where does it fail? How might it be improved? 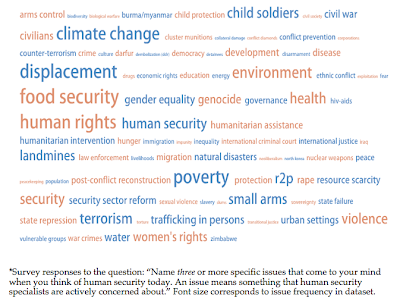 Also, as consumers of social science research, how do you think the community should handle these ethical concerns? It’s not pictures that inflame anti-American opinion. Brutality has done that already. And trying to cover up that bad behavior only makes it look as if the new Administration is complicit. In short, this is the worst tactical decision I’ve seen Obama make so far, and I fear the grave consequences of associating his administration with the worst excesses of the past eight years. Stated in this particular way, an indisputible statement of principle is conflated with and therefore masquerades as an empirical “fact,” one which is blatantly untrue. This trope was one of the Bush Administration’s many brilliant inventions, and was designed as a public relations counter-response to growing acknowledgement that US military and intelligence personnel not only had tortured detainees, but had in fact been ordered to do so. In the context of some other disturbing continuities between Bush Administration policies and Obama’s policy so far, this worries me. It should also worry Obama’s advisors: these kinds of rhetorical not to mention policy non-changes are precisely the type of behavior that will undermine Obama’s effort to reengage the international community in the wake of Bush-era unilateralism. Why? 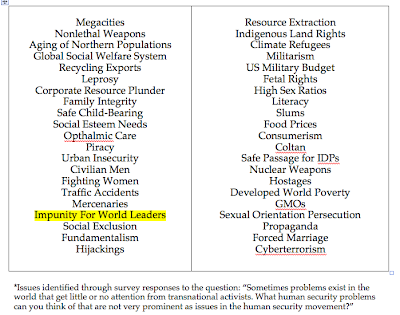 Because these particular issues are so closely emotionally associated with Bush-era unilateralism. If there is any sense in Obama’s decision to retain a policy of extraordinary rendition (and I can’t see any), there is certainly no sense in the decision to draw attention and umbrage to it by failing to at least change the rhetoric. One of the most interesting conversations I had at ISA was about the Geneva Conventions. I had suggested in The National Interest last year that the Bush Administration and the human rights community work together toward an Additional Protocol to clarify the law, and my colleague asked whether I thought this advice still applied after the transition. I would say it is even more relevant now. The Bush White House flaunted multilateral institutions like the torture regime because Bush’s policy was to flout multilateralism. Obama can’t continue that course – simply reinterpreting and then violating the law – while claiming to embrace multilateralism. But what he could do is lead a multilateral effort to clarify the law. An effort framed in good faith by a skillful and (as yet) largely untarnished leader like Obama could unite both the human rights community and those concerned about how to apply the laws in an era of asymmetric warfare. It could resolve some of the interpretive problems as a community. Obama should shift course and lead this movement before the opportunity is squandered as the US once again instead becomes its target. *I mean, how it within his perogative or power to “not allow people to plot against America”? What does that mean as a basis for one’s foreign policy? Bush Confesses (Without Being Tortured). Now What? One of these low-salience issues in particular stayed in my mind this week as I kept an eye on the news: “Impunity for world leaders who committed war crimes or crimes against humanity while in office.” It didn’t make the NYTimes headline this morning, but if I heard Bush correctly yesterday, he basically admitted to having signed off on torturing detainees during his administration. Let’s leave aside the fact that “sure, I tortured” ranks pretty high among those things you’re not supposed to say as a sitting head of state, even if you’ve been there done that. Really, the important question is what the Obama administration should do about this legacy once taking office. Not about reversing Bush’s torture policy, which is largely a given. About holding the previous head of state accountable for that torture policy. And yes, it’s quite interesting to see so little attention to this building a norm to do precisely that. Sure there’s the international criminal court, but that’s an institution with a limited mandate and short reach. What about the responsibility of new governments to hold their predecessors accountable for crimes committed while in office? What about an international movement to create such a standard for democratic regimes? At Harper’s, Scott Horton argues that there is a strong historical precedent for future leaders punishing a previous leader who willfully violates the laws of nations. Torture is a crime of universal jurisdiction, ranking right up there with genocide. The emphasis of activists so far have been simply to roll back Bush’s torture policy, but there are real questions to be asked about whether the international criminal regime has got to a point where it can reach and punish harms inflicted by the President of the most powerful country in the world. As long as Bush stays in the US, the answer is probably no. But that doesn’t mean that the incoming administration couldn’t take steps, or that the human security community could not work harder to generate a sense of obligation for all governments to do the same. Sixty years ago yesterday, in response to the atrocities committed in World War II, the U.S. joined world leaders in supporting the United Nations’ Universal Declaration of Human Rights. Click here to sign. Complete text of the petition is below the fold. Though we come from a variety of backgrounds and walks of life, we agree that the use of torture and cruel, inhuman or degrading treatment against prisoners is immoral, unwise, and un-American. In our effort to secure ourselves, we have resorted to tactics which do not work, which endanger US personnel abroad, which discourage political, military, and intelligence cooperation from our allies, and which ultimately do not enhance our security. Our President must lead us by our core principles. We must be better than our enemies, and our treatment of prisoners captured in the battle against terrorism must reflect our character and values as Americans. The “Golden Rule.” We will not authorize or use any methods of interrogation that we would not find acceptable if used against Americans, be they civilians or soldiers. One national standard. We will have one national standard for all US personnel and agencies for the interrogation and treatment of prisoners. Currently, the best expression of that standard is the US Army Field Manual, which will be used until any other interrogation technique has been approved based on the Golden Rule principle. The rule of law. We will acknowledge all prisoners to our courts or the International Red Cross. We will in no circumstance hold persons in secret prisons or engage in disappearances. In all cases, prisoners will have the opportunity to prove their innocence in ways that fully conform to American principles of fairness. Duty to protect. We acknowledge our historical commitment to end the use of torture and cruelty in the world. The US will not transfer any person to countries that use torture or cruel, inhuman, or degrading treatment. Checks and balances. Congress and the courts play an invaluable role in protecting the values and institutions of our nation and must have and will have access to the information they need to be fully informed about our detention and interrogation policies. Clarity and accountability. All US personnel – whether soldiers or intelligence staff – deserve the certainty that they are implementing policy that complies fully with the law. Henceforth all US officials who authorize, implement, or fail in their duty to prevent the use of torture and ill-treatment of prisoners will be held accountable, regardless of rank or position. Hat tip to Hank at Eclectic Meanderings.